Custom Window Treatments by Exciting Windows! personal, custom window treatments you’ll love, for the lifestyle you deserve. You know you’ve got to do something, but you’re not sure how to decide. Enjoy the design process with the guidance and personalized service from our creative experts. We’ll take care of the rest – have a glass of wine and enjoy the results! You've helped make our home more beautiful as well as more comfortable. Thank you for all your hard work. 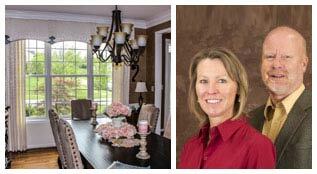 My husband and I hired Susan Day to design and install unique treatments in our home. We really felt she kept our best interests at heart, giving us suggestions and paying attention to the small details. We believe she is honest and fair in her pricing and would highly recommend her to others. I love the services provided… they always provide an array of choices available and lets the customer make the decision. I have used Exciting Windows! for all my window treatment since I purchased my home five years ago and I have never been disappointed. And, the guarantee is great. I LOVE my Lutron automated shades! Thank you for showing me this great option that fit my budget. They are so convenient, I can’t imagine pulling cords or having uneven shades ever again. You can get advice, order and have your window coverings installed with Exciting Windows. Susan gives you the confidence that you are getting exactly what you want. Thank you for helping me make a decision on these shades…I absolutely love them! I was quite impressed with their attention to detail. They made all the fabric patterns match in the Cornice Box over the patio door and coordinating seat cushions. Because I used to sew, I notice those things. Everything was just great. I really enjoyed both Wilma & Tamara, they were awesome. Stacey with Exciting Windows did an awesome job on my 20ft tall living room drapes as well as my formal dining, kitchen, and bathroom custom draperies! I\’ve been very happy with Stacey\’s work and would definitely recommend her to anyone looking for custom draperies!